Rivalries with other teams have escalated into serious violence. A group of ultras who label themselves the Fedayn — ‘the devotees’ — after a group of long-forgotten Iranian guerrilla fighters are regarded to be responsible for the organised hooliganism. In 2014 Daniele De Santis, a Roma ultra, was convicted of shooting Ciro Esposito and two others during clashes with Napoli fans who were in Rome for their club's Coppa Italia final against Fiorentina. Esposito died of his wounds. De Santis was sentenced to 26 years in prison, later reduced to 16 years on appeal. Roma ultras have displayed banners celebrating De Santis. 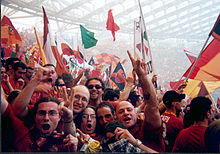 Since re-capitalization in 2003–04, Roma had a short-lived financial self-sustainability, until the takeover in 2011. The club had set up a special amortisation fund using Articolo 18-bis Legge 91/1981 mainly for the abnormal signings prior 2002–03 season, (such as Davide Bombardini for €11 million account value in June 2002, when the flopped player exchange boosted 2001–02 season result) and the tax payment of 2002–03 was rescheduled. 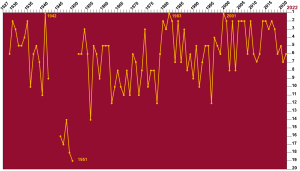 In 2004–05, Roma made a net profit of €10,091,689 and followed by €804,285 in 2005–06. In 2006–07 season the accounting method changed to IFRS, which meant that the 2005–06 result was reclassified as net loss of €4,051,905 and 2006–07 season was net income of €10,135,539 (€14.011 million as a group). Moreover, the special fund (€80,189,123) was removed from the asset and co-currently for the equity as scheduled, meant Roma group had a negative equity of €8.795 million on 30 June 2007. Nevertheless, the club had sold the brand to a subsidiary which boost the profit in a separate financial statement, which La Repubblica described as "doping". In 2007–08, Roma made a net income of €18,699,219. (€19 million as a group) However, 2008–09 saw the decrease of gate and TV income, co-currently with finishing sixth in Serie A, which saw Roma made a net loss of €1,894,330. (€1.56 million as a group) The gate and TV income further slipped in 2009–10 with a net loss of €21,917,292 (already boosted by the sale of Alberto Aquilani; €22 million as a group) despite sporting success (finishing in second place in 2009–10). Moreover, despite a positive equity as a separate company (€105,142,589), the AS Roma Group had a negative equity on the consolidated balance sheet, and fell from +€8.8 million to −€13.2 million. In the 2010–11 season, Roma was administrated by UniCredit as the Sensi family failed to repay the bank and the club was put on the market, and were expected to have a quiet transfer window. Concurrently with no selling profit on the players, Roma's net loss rose to €30,589,137 (€30.778 million as a group) and the new owner already planned a re-capitalization after the mandatory bid on the shares. On the positive side, TV income was increased from €75,150,744 to €78,041,642, and gate income increased from €23,821,218 to €31,017,179. This was because Roma entered 2010–11 Champions League, which counter-weighed the effect of the new collective agreement of Serie A. In 2011–12, the renewal of squad and participation in 2011–12 UEFA Europa League had worsened the financial result, which the €50 million capital increase (in advance) was counter-weighted totally by the net loss. In the 2012–13 season, the participation in domestic league only, was not only not harmful to the revenue but increase in gate income as well as decrease in wage bill, however Roma still did not yet break even (€40.130 million net loss in consolidated accounts). NEEP Roma also re-capitalized AS Roma in advance for another €26,550,000 during 2012–13. A proposed capital increase by €100 million for Roma was announced on 25 June 2014; however, until 22 May 2014, NEEP already injected €108 million into the club, which depends on public subscription; more than €8 million would convert to medium-long-term loan from shareholder instead of becoming share capital. Another capital increase was carried in 2018.